Well, it's all over but the cleanup now huh? Today's post is rather short......lucky you.......lol. Here in a bit I am gonna throw on some clothes and run out to the store........not sure if that is a great idea on the day after Christmas or not but I need coffee and the kids need food. And if 'm lucky I might score an after Christmas deal. Tomorrow I'm taking the kids out to spend their Christmas cash from the grandparents. Steven had cash of his own earlier in the month and bought himself a super cool light up xbox controller......and it quit working after 5 minutes.....lol. So we are going to return it and I know my boys....... game-stop will never be the same....lol. They will drop all of their money there and that will be the only place I have to take them....Yayyyyyy! And my plan gets even better........Hobby Lobby is right across the street!!!! I got a decent chunk of Christmas cash but I am always so hesitant to spend it on myself. With money being as tight as it has been for us the last few months I just can't justify it. But I will buy a little something and put the rest aside. Thank you Santa!!!! A while back I had gotten a wonderful stash of mixed media goodies from a Paper Haus blog hop. And the day I got them I painted a shipping tag with one of the inks and left it to dry and then....forgot about it......lol. (also a result of crafty ADHD) I came across it the other day while cleaning some stuff out of my craft caddy and there it was. So I stuck it away again and them pulled it out after seeing the 3rd day challenge was to use 3 paints, inks or mists. I could do this one!!!! And its something totally different and kinda out of the box for me....and I love making a mess......lol. The first layer of paint is Tattered Angels Glimmer, Glam Glitter Paint. Try saying that 3 times real fast......lol. The color is Blue Suede Shoes......and I really just kinda dripped it all over with a paint dropper and let it do its thing and dry. Then a month later.......cuz that's how I roll.......I used my fingers to spread Extreme Glitter paint by Plaid...it driers clear and really just gives a glittery feel to anything you use it on....and the more you layer it the better it looks.....it's a shame the glitter effect doesn't show up on my computer. I fussy cut the lil snow man from some paper from Reminisce and the snowflake is actually a left over gift tag I found as we were coming up the steps from the garage last night.....lol. I pop dotted them both and then went over both of them with the glitter paint. There are some white blobs all over this thing that are SUPPOSED to be snow falling....lol. I used stamps from a Hobby Lobby pack with no name......lol. I found them with the Christmas stuff a few weeks back......seriously, no brand name on them.......but it was for card making and had some cute little things in the set. 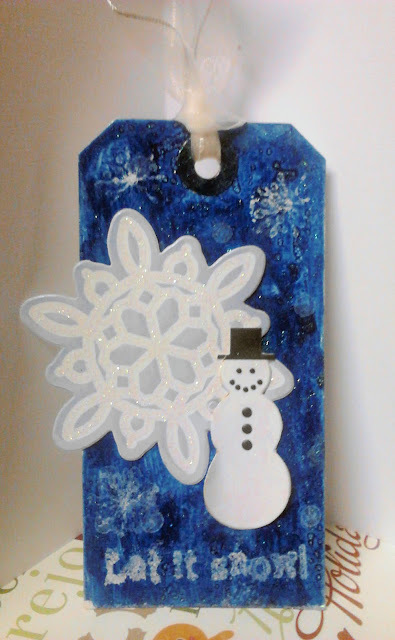 I used snowflakes and the Let it snow and I had a white stampabilities stamp pad that was extremely juicy.......and it kinda spread out and gave it this messy look. But it's ok, I kinda like it.........I added a sheer white ribbon and called it good!! I'm going to make many more of these....perfect for cards and gift bags!!! And FUN!!!!! Ok....I'm off to do my thing! Have a great day!!! Love love love your tag!! LOVING the background and the snowman!!!!! Beautiful tag, Tina! I love all the texture. Thanks so much for stopping by during the Paper Smooches December DT Blog Hop!